It's Not Only Easier To Stay Cooler In A Swimming Pool, But Working Out In Water Has Massive Perks. Aquatic exercise decreases compression of body joints and makes you feel about 90 percent lighter. When you jump or run in the water, your body does not experience the same impact that these moves cause on land. In water aerobics, due to our own water weight, the buoyancy of the water helps take off some of the impacts we tend to place on our body. This makes water aerobics appealing to those with arthritis, back problems, foot or leg injuries, and knee conditions. It also helps in decreasing pain associated with movement and is a safer environment to work on balance problems. Pregnant women and the obese also benefit from the reduced impact. An hour-long water aerobics workout burns approximately 300 calories so three to four weeks will result in measurable weight loss. Though the actual amount you burn will depend on your size, the intensity of your movements, as well as water temperature and depth. To ensure the body is getting a full workout combine strength and cardio workouts mixed with water resistance in an aquatic exercise. In general, faster movements incorporating the upper and lower body in deep water elicit the greatest calorie burn. The body can burn between 400 to 500 calories in an hour of exercise depending on water temperature, weight (including additional weights such as dumbbells and weight belts), cardio activity, volume and buoyancy. Water aerobics improve blood circulation in your body. The water pressure enables to circulate one’s blood flow more effectively throughout the body, decreasing blood pressure, thus decreasing resting heart rate. 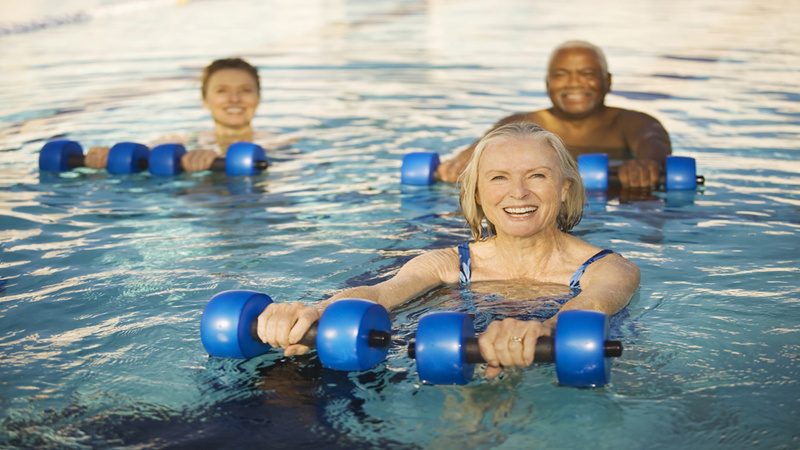 A 10-week course of water aerobics can reduce blood pressure in patients diagnosed with high blood pressure. With reduced risks of obesity and a lower blood pressure, the chances of contracting a heart disease get slimmer. While exercising in water, you get a range of motion benefits due to the fact that effects of gravity are lessened in water. The natural water movement encourages relaxation of muscles, exerting muscles that you would not otherwise be able to exert outside water. You can achieve long-term flexibility as joints move through a wider range of motion. Water is a flowing and constantly changing product of nature. Water flows in multiple directions, the resistance in the pool is greater than 12 times the resistance of air. This ensures that the body’s muscles get a rigid workout. Simply kicking and cupping the water along with equipment like water paddles, noodles, and single or double buoys, and kickboards help contribute to muscle development and strength gain, which translates into a higher metabolism and healthier body.